And I long for stillness and for silence. I know as my true home. How bright, clear, and unmistakable is the image of the golden leaves against the azure sky! It reminds me that mindfulness and clarity go together. Lately, I have become aware of an ongoing mental buzz caused by a number of accumulating commitments. During this past week, I've been reflecting upon how I can streamline my commitments so that I can live my life with greater integrity and clarity and a quieter mind. 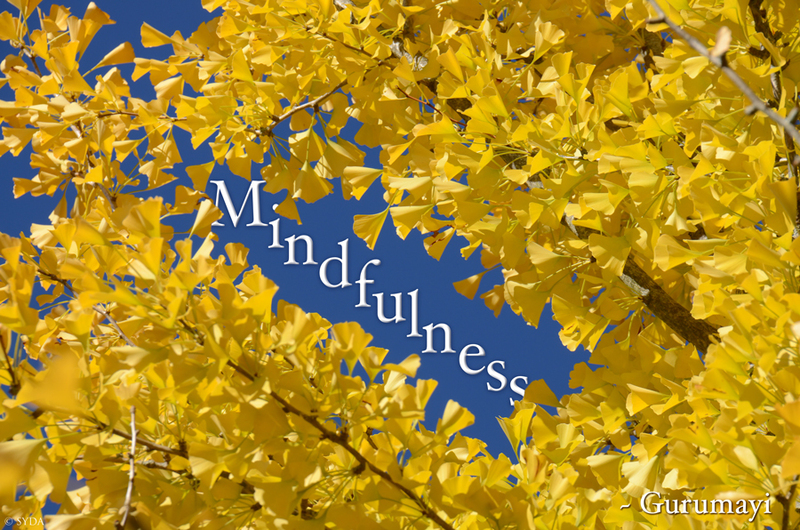 When I beheld the image and the word mindfulness, I realized that as I give up what I can't properly care for, the buzz will fade, and I will be freer to be more fully present in each moment. Thank you, Gurumayi, for continually bringing clear guidance into my life and sadhana! This posting is an answer to my questions: What teaching do I need to practice at this time, in this situation? What virtue do I need to cultivate? Mindfulness. Everything is worthy of my loving care and attention. After seeing this, I went outside to prune the citrus, and as I pruned, I heard the local piper playing “Amazing Grace” on his bagpipes. "The colors of grace"—what a beautiful description of the ways grace can reveal itself! I realize that grace has given me room, a kind of capacity to be mindful in the midst of daily activities. I remember that before I received shaktipat initiation, it felt that I was always rushing from one moment to another; I felt pushed with no room for a pause. Now, when I try to give attention to the action necessary in any given moment, when I try to give myself time for it, when I breathe in a relaxed way, I feel a sweet love towards myself. To me, it feels like I'm taking care of myself in a loving and gentle way. I have made this now into a resolution: wherever I am, whatever I do, I want to make myself comfortable by giving myself room and time. And then, naturally, mindfulness settles in and a subtle, nectarean love follows. With mindfulness there is no fear, no rush, no stress.